After querying friends and family, I elected to sleep on the time-consuming and expensive decision. I woke up Sunday morning wholly ambivalent; I cannot recall the last time I was so torn. Mark Twain once opined: “Twenty years from now, you will be more disappointed by the things you didn’t do than by the ones you did do.” Twain sat on my shoulder and whispered in my ear. The idea that I might miss something magical (I was thinking a Kershaw no-hitter), and regret it forever, was too much to bear. So, as Mr. Clemens implored, I threw off the bowlines and sailed away from the safe harbor of Palm Beach airport. When I arrived in Charlotte to switch planes, I learned my 4:50pm flight to Houston (which would have gotten me there in time for the national anthem) was delayed until 7pm. Crestfallen. That is the only word I can use. Despondent, crushed, hopeless? Those work as well. I was trapped in North Carolina with a stupidly-priced ticket burning a hole in my pocket, and no way to get deep in the heart of Texas. 7pm became 7:15pm, which became 7:25pm, which became an 8pm take-off. Doing the math – which I had been doing for three hours – I knew I would arrive at the park, at best, in the 6th inning, but if Kershaw and Keuchel duplicated Game 1, I would get there in time to help clean the stands. I considered bagging the whole plan and grabbing the next flight to L.A., but I had come this far (and didn’t want to spend more money changing another flight). Like it or not, this was my journey; destiny my guide. The 2 hour and 37 minute flight to Houston came in 11 minutes early – minor miracle. Channeling my inner Ezekial Elliott, I charged to the front and was the first to deplane at 9:29pm. Channeling my inner Jerry Maguire, I sprinted through George Bush Intercontinental Airport, literally threw my suitcase into a cab and told the cabby – in a cliché – “there is something extra if you get me downtown in twenty minutes.” I was standing in the Crawford Boxes at 10:04pm – it was the top of the sixth. I had missed the first five innings. I had missed the Dodgers blow 4-0 and 7-4 leads. I had missed Bellinger’s three-run homer and Altuve’s counter-punch. I had missed Kershaw and Keuchel. I was not about to miss another pitch. Before the bottom of the sixth, I walked down the third baseline and found a family leaving Section 116 (mind you, it was nearly 10:30pm on a school night). They gave me a seat in Row 20, and I did not move for more than two hours. No bathroom breaks; no beer runs; no seventh-inning-stretch ice cream. Hell, I barely sat down. The Astros fans in Row 19 decided this was a “stand all game” situation, so I followed suit. What I witnessed, endured, and withstood for next five innings was unlike anything I have ever experienced. If you are like me, you have obligations outside of sports. You have wives/husbands, kids, a job. You cannot devote your life to a sporting event. How many times have you wished a game would just end because you have a meeting early the next morning? Or the anticipation of post-game traffic fills you with so much dread that it interferes with your enjoyment of the game? But on this night, 1,500 miles from home, with no wife and no kids to attend to, a hotel room across the street, my only concern being a flight more than ten hours away, I was all-in. When Chris Taylor came to bat with two outs in the top of the 9th and the tying run on second, I wanted the base hit because I was rooting for the Dodgers; I wanted the base hit because a three-run ninth to tie the game would be epic; but mostly, I wanted the base hit because I simply didn’t want this game to end. I. Could. Not. Get. Enough! Many writers, all more skilled than I, have written about this game. You all watched it. You know the highs and lows, the ins and outs, the excitement and disappointment, and all the moments in between. But being there was something else. It was an emotional roller coaster with no end in sight. One of the beauties of baseball is the lack of a clock, so there are no constraints on the potential end point. This game could still be going, with Bob Knepper pitching against Tom Niedenfuer. In the stadium, we weren’t privy to the statistical oddity we were witnessing, we just had to intuit it. We didn’t have the replays and the commentary available to those watching at home, so we relied on one another to talk ourselves through what just happened. Did that actually happen? It was a communal experience, and I wasn’t even a real member of the community. Angela Matthews, a 10-year veteran of the Texas Air National Guard sang “God Bless America” as part of the 7th inning stretch. She was joined by 43,000 back-up vocalists, who made this rendition one of the coolest I have ever heard. Houstonians and Angelenos joined together as Americans for three minutes of beautiful harmony in the midst of a gut-wrenching battle of wills. From my angle, George Springer’s homerun on the first pitch of the bottom of the 7th was still rising as it left the yard. It was gone instantly, and landed – as many have pointed out – with an explosion on the train tracks above the left field seats. It seems implausible you could hit a ball harder. I have never seen a ball hit higher than Carlos Correa’s homerun three batters later. Off the bat, I was excited to finally see a ball hit the roof. It went so high, and hung in the air so long, that I had time to track the ball, then track Kiké Hernández tracking the ball, then track the ball again, then watch Kiké drift back to a few feet in front of the left field wall, and then watch the ball drop into the second row of the Crawford Boxes as if discarded by a wayward seagull. StatCast tells us that the ball went 169 feet in the air and stayed there for 6.8 seconds. It was unreal. At one point, an overzealous fan in American flag boxers (and not much else) sprinted onto the field. He juked and jived, pissed off Houston’s finest, and ultimately found himself hogtied with multiple knees in his back. Bummer he missed the rest of this game to win a sophomoric bet. With two out in the bottom of the 9th, Asia’s public enemy number one hit a long drive to left center. Off the bat, I was certain this was a walk-off homerun. This was Gibby, Kirby Puckett, David Freese, and a handful (13) of others who ended a World Series game with a dinger. As sure as I was that Cody Bellinger had ended Game 2, there was no doubt that the guy who should have been suspended just ended Game 5. The ball hung in the air for what seemed like forever, only to touch down in the one place – the only place – in the entire ballpark where it was not a round-tripper. While that ball traveled nearly 400 feet, 43,000 people held their collective breath. It was an odd sensation. Somehow the ball hit just below and just to the left of that all-determining yellow line. Karma? Gurriel was left in scoring position and we had free baseball. 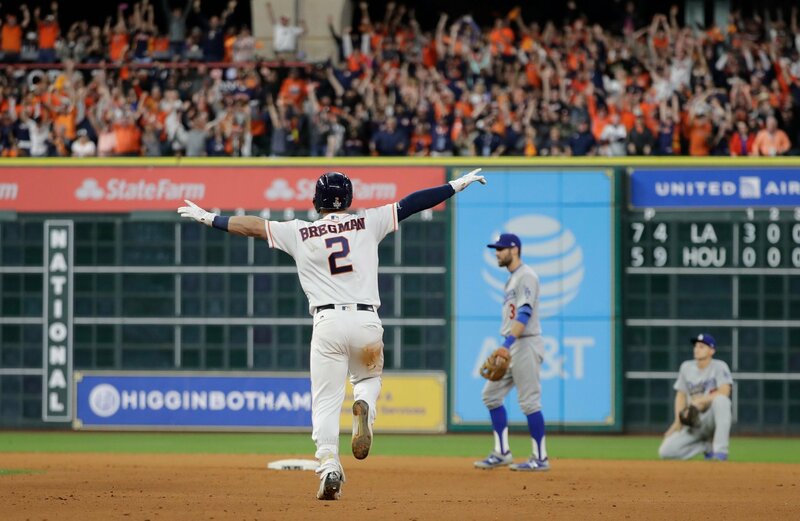 When little-known Derek Fisher slid home with the game-winning run following Alex Bregman’s 10th inning single, the roar in Minute Maid Park was extraordinary. Equal parts exultation and exhalation, the Houston Hopeful were going home Monday morning one win away from a World Series title. I am told you could get a feel for the crowd noise on television; I cannot imagine that is even half true. It was thunderous, raucous, cacophonous; and it stayed that way for a long time. This game had ties in the 4th, 5th, and shockingly, the 9th inning. Three 3-run leads were blown. There were 11 runs scored from the 7th inning on. The Dodgers scored three runs (to tie the game) in the top of the 9th, each time with two strikes. So many crazy, insane, incomprehensible things happened in this game that we can hardly remember the merely extraordinary. In time, we will remember, and we will look back with awe. If you love baseball as much as I do, and if you have read this far I am assuming you do. And if so, then such a question needs no response! Addendum: The foregoing was written in the haze of Game 5. In that time, Game 6 was played. Dave Roberts did all sorts of weird things, and they all seemed to work. Joc Pederson continued to only get extra-base hits. And the Dodgers beat Justin Verlander. By 2017 standards, this game was somewhat quotidian. As such, Game 7 stands to be one for the ages. As I write these words, I feel tonight much like I did early Monday morning: unsure how I will be able to fall asleep! An incredible season has but one game left, winner take all.